The City of Mustang is located 6 miles south of I-40 on Mustang Road, within the far southwest quadrant of Oklahoma City. The Mustang school system draws families to Mustang. Mustang students excel in competitions running from academic to athletic. Mustang is family oriented, and safe- with a small town feel. The sense of community fuels small town pride. There are always things to do in Mustang. The Wild Horse Park Sports Center and the Town Center Community Center facilities provide quality recreation opportunities, our award winning library, and our senior center are packed with activities, classes, and events. These facilities show Mustang’s investment and commitment to families. 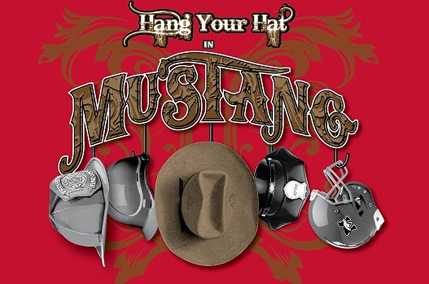 Mustang’s largest festival is the annual Western Days event. Friday night is Blue Grass Music and a chili cook-off. A carnival with rides runs throughout the weekend. The Mustang Round-Up Club Open Rodeo is held on the arena grounds both Friday and Saturday evenings. On Saturday, the Kiwanis Pancake breakfast kicks off the days events, followed by the 5K and Fun Run at the high school and then our grand Parade. The Mustang car show, food & arts and crafts vendors, entertainment, and the Pet Show/Contest go on throughout the day on Saturday. The Mustang Rodeo and street dance end the festival Saturday night.